The second is after this process is completed, which I don’t have a screenshot. Are both necessary? did two updates yesterday. Both from v15.0.4 to v15.0.5. There I have not seen the second step you describe. Have you found another backup on your system? I have not looked for a second backup on the server. 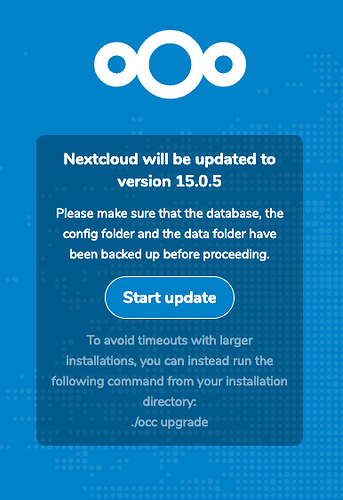 I just noticed when updating from 13.n to 14.n and then 14.n to 15.n, the page that loaded after the Initializing page there was another step suggesting a backup. However, those were from major release to major release. I didn’t complete 15.02 to 15.0.4. I’ll try 15.0.2 to 15.0.5 and take a screenshot if prompted again. So I did receive the message again. 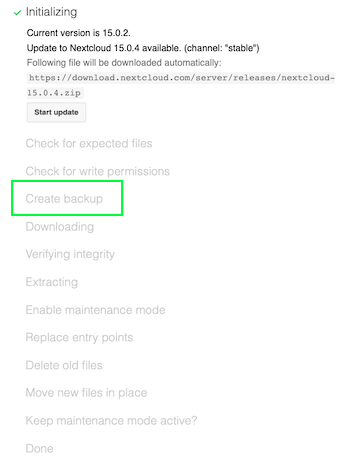 Is this second backup different to the backup performed during Initializing? Oh, this is a misunderstanding. The updater itself will save your installation (nextcloud folder incl. apps), but not your db and user data! For this you have to take care about yourself.